1. Every day during Advent, Christmas, and Lent. 2. Awakened Life: every Monday in Ordinary Time (outside of the above liturgical seasons). Wounds and doubts are intricately related. For many of us, we doubt God’s presence or divine goodness more when we are most wounded by life. Our trust is eroded when we cannot accept or understand suffering, others’ or ours. We are called to touch the wounds of Christ in others around us. In doing so, we allow grace to heal our hearts and minds, transforming whatever that threaten life and erode trust within us. For me, this Easter Season involves an invitation to let the Risen One draws me with his tender, merciful gaze and leads me with his peace as I engage my doubts and touch the wounds of others. New life flows out of this experience. The story of Thomas is our story. By touching wounds and doubts (ours and those of others), we come to greater peace and deeper faith. We come to have and to share life in Jesus’ name! Lord Jesus, breathe peace into our wounds and doubts so that we may be your healing, merciful love. If we won an award, lost a tooth, or had something exciting happen as kids, our first call was always to our grandmother. We would call her with our news as soon as we got home from school and she usually answered. But in the pre-cell phone and pre-voicemail world of the 1980s sometimes we would have to wait and try again later. When this happened, we would not call my aunt or anyone else until we could reach our grandma so she could be the first “hearer” of our news. In today’s readings, I can identify both with being the teller and the receiver of incredible news. 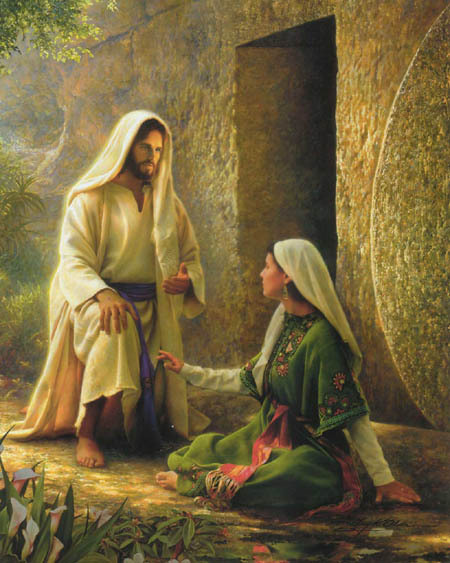 Jesus did not appear to just any random person who happened by the tomb; He chose Mary Magdalene first for a reason. Maybe it was because of her raw faith and openness to what would seem “impossible” to most of us. Maybe it was because she so missed Him that she could not stay away from his tomb. Maybe it was because of a deep friendship between them: what is happening right now is so real and awesome that I don’t want you to hear it from anyone but me. All of these first hearers and witnesses to the Resurrection could not keep the news to themselves. Like a new grandparent who proudly shows baby pictures to people waiting in line in the grocery store or a high school student who hangs a banner on a freeway overpass inviting his girlfriend to prom, are we overflowing with excitement and joy about what Jesus has done to us that we cannot contain it? Who are my first “hearers” of any news (good or bad)? What does it feel like for me to receive news I cannot hold inside? Lord, help me to rush to you with my daily reality like you drew close to your dear friends in those first Easter days? I have always been a skeptic. I was undoubtedly the annoying kid that asked, “Why?” about five times a minute. In one of the Sunday CCE classes before my first communion, I asked Sister Mary, “Why did Jesus have to die? Why didn’t God save Jesus?” Sister Mary responded, “It’s because God loves you. Jesus died for our sins.” I began feeling extremely guilty lying to my mom and hitting my sister the night before. I mean… Jesus died because of it! Then Good Friday came along and I rejoiced because popcorn was strewn around Jesus’ feet during the veneration of the cross. The answer no longer mattered. As I got older, the questions came back. The need to understand and analyze returned. I kept asking why. I knew the answers were there, but I failed to grasp it. This Lenten season has been different from the previous. I am more prayerful, perhaps because I am more troubled. The need for comfort is more pressing. I dream more, both troubled and happy dreams. In one of the happy dreams, I was a child climbing into God’s lap as he read stories from the Bible. The image was fuzzy. I don’t know what was said, but I knew it made sense. Today’s gospel drew an image in my mind. Jesus knew he was going to suffer. He also knew he would rise again on the third day because it was written in the Scriptures. He did this for us, to repent for our sins. The image of Christ continually dying and rising for us tugs at the heartstring, and Sister Mary’s words came back. God loves you. Often, usually when my spirits are low, I wonder if I am worthy of such love. Today, I wonder if I have read the Scriptures wrong. Maybe instead of asking if I’m worthy of such love, I will continue to pray for clarity and better understanding of His words. Lord, please clear my muddled mind and help me understand your words. As of late, I have been weeping over my childhood, filled with painful moments in need of healing. My father, who carried his own unacknowledged wounds, transmitted his anger onto his children. As I grew up with an unbalanced self-image, my family also contributed to the shame I carried. When I swore to never be like my father, I also repressed the anger that screamed inside of me. For twenty years, I rejected my dark self and buried it, thinking that it would enable me to move on with life. The truth was I needed help. It came in the form of a class on psychological healing and spirituality with Father Jim Clarke, who said, “If you don’t transform your painful emotions, then you will transmit it.” Evidently, uncontrollable flashes of anger already erupted in my significant relationships. My shame also geared me towards co-dependency many times. So against my ego, I set out to address my dark self in order to move forward. I am now at the first step of healing – the most difficult step – which is to identify the painful emotions and hold them with respect. I need to resist the twenty-year habit of running away from them. I need patience and courage to sit with the anger and shame – to feel as bad as I feel and be okay with it. In other words, I am mourning and weeping like Mary Magdalene. The first lesson in healing is to admit I cannot change what happened in my childhood, but I can choose to let go of its effects by holding my pain with tenderness. How has the image of death and resurrection touched you? Jesus, I hold my anger and shame in my hands and offer you all that I am. Be with me as I learn to let go of my pain. I trust in you. The resurrection of Jesus has been one of the most difficult things for me to relate to in my walk of faith. The crucifixion has always been something more tangible for me. In the crucifixion, the raw humanity of it all is on full display. And not only is it on display in the gospel, but it is something I can see take place all around the world today. All around the world people are suffering and dying because they are standing up for something or someone. This I can touch, taste, hear, see and smell. Crucifixion is very real. But the resurrection? Not so much. One response I often have is to turn the resurrection of Jesus into an allegory. I tend to focus more on how the resurrection story reveals a deeper message about how we must die to things we are attached to in order to live. And I am convinced that there is truth to that. I firmly believe that the resurrection of Jesus is an allegory. But the real question for me really becomes: what if it is something more? If you have doubts about the tangible reality of the resurrection like I do, perhaps you are keeping God in a neat little box you have created. I do this all the time, especially with the resurrection. I keep Jesus in the box of how I have come to see this thing we call a “body.” I keep thinking that our bodies are something we own, something we have control of. And sadly, that can even spill over beyond my own body to someone else I’ve objectified. We are presented with a scene in Matthew’s gospel today where the chief priests are worried that they have lost control of Jesus’ body. They even create a lie that the disciples stole the body just to maintain the illusion of control. This is probably a natural reaction for anyone in that position. We have developed a certain understanding of the body. But what would happen if each of us opened our bodies to new possibilities? What if instead of holding onto my body, I let it go? What if I truly offer my body as pure gift? Is it not possible that our bodies can transcend the three-dimensional world we think we are limited to? This, I now believe, is what happened to our Lord. All because he offered his entire self, his entire body. Lord, show us what this was like! In today’s Gospel, sadness and sorrow filled Mary Magdalene’s heart as she came to prepare the body of Jesus. Her grief shifted to panic when she discovered the stone removed along with an empty tomb. She ran to tell Peter and the other disciples that He was gone. They were just as bewildered when they arrived to the tomb. Moments later, their heartache and confusion transformed into joy realizing that Jesus has risen from death to eternal life. Reflecting upon this scripture, I could imagine how Mary expected the stone covering to be properly in place over the tomb and how fathoming anything good to unfold from the tragic events of the previous forty-eight hours was inconceivable. It also appeared that no one else amongst the disciples anticipated the resurrection as well. Mary Magdalene and the other disciples remind me of how God continuously invites me to be more courageous in taking greater risks to fall in love and stay in love. In moments of despair, when I am tempted to fear the worst, or fail to imagine that God’s love can permeate every single disturbing happening, He encourages me to wrap my heart and mind around the unbelievable and trust that my fears can be carriers of grace. By forgiving what is unforgivable, accepting what is unacceptable, embracing the myriad of diversity that shakes me up, and pleading for a resurrection inside my own battered heart, I can expand my idea of mercy and find a God, who patiently waits for me, comforts me, and makes me whole again. What would it take for me to turn around and believe? What is it that I cannot imagine and keeps me searching in the empty tomb? Something strange happened to me in February 21, 2012. I spent an all-night vigil inside the Church of the Holy Sepulcher, which housed the tomb of Jesus. I stayed mostly in the Chapel of the Angels, the small antechamber where the angel announced to the women that Jesus had been raised. As I sat looking in the tomb, a deep silence ensued. Something beckoned me to wait. Waiting for what I know not of. I tried to fill the silence with prayers of petitions for people, with moments of distractions and yawns. Gradually, something dawned within me. I don’t know what it was, but a deep sense of peace and trust grew within. Then a quiet, gentle joy slowly emerged. I can’t really explain it. Such peace and joy lasted the entire night, at a consistent depth and duration that I had never known before. A simple and powerful truth grabbed me: Jesus’ resurrection happened at the same place where he was entombed. At the same place where death lays new life arises; where fear treads, love dances; where grief dwells, hope springs; where we struggle, Christ’s peace rests. It has been four years, yet this experience still quietly haunts me. It helps me to find meaning in the sudden and tragic death of my brother-in-law last September. The full text of the ancient homily on Holy Saturday speaks of the great silence after Jesus' death as God-King sleeps. In the silence that seems like nothingness and meaninglessness, something unbelievably new and life giving is happening. Jesus descends into all forms of human death and dying, suffering and hell, sins and failures. In doing so, he transforms everything! Before Easter Sunday arrives, we are invited to rest in the silence of Holy Saturday. For God’s sleeping and resting awakens the joy of Christian faith. Something strange is happening. What if today, we simply rest, doing nothing, in God’s tender embrace? Lord, help me to rest in silence with you, to be in solidarity with all who are abandoned and alone, learning to trust in your faithful love which turns death into life.